The move from EurekaMag.com to GeoScience.net is part of the research content provider's evolution to a global science brand. This change is accompanied by faster delivery of a significantly upgraded content base. On August 31, EurekaMag.com has changed its domain name to GeoScience.net and its slogan to Biology - Geography - Health, reflecting a shift to a global digital approach and to further strengthen its presence worldwide. The new streamlined presence and its seamless mobile site are all accessed via the new single URL. GeoScience.net currently covers a total of 37.4 million bibliographic references from as early as the beginning of the 18th century, i.e., 1703. While this content base has not been extended, the change in URL is accompanied by a significantly upgraded number of article summaries and abstracts: while the old site contained a total of 11.8 million summaries, the new domain features a total of 15.2 million abstracts which is an increase by almost 30%. 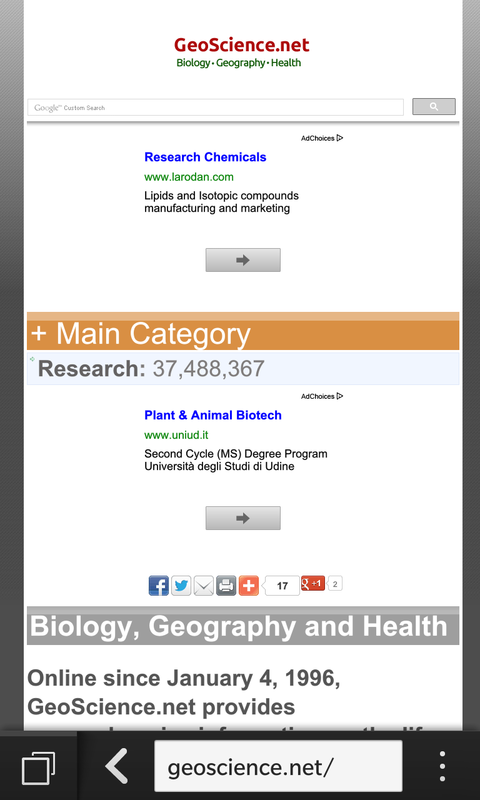 Now over 40% of all bibliographic references contain a summary of their scientific content. Drawn from a current total of 8,048 scientific journals, GeoScience.net covers the basic and applied biological sciences, geographical sciences, health sciences, and chemistry sciences. While the biological disciplines include agriculture, forestry, environment, anatomy, biotechnology, ecology, genetics, microbiology, physiology and zoology, the geographical sciences cover geology, meteorology and astronomy. The health sciences include audiology, dentistry, dermatology, endocrinology, gastroenterology, healthcare, immunology, medicine, neurology, nutrition, oncology, pathology, pharmacology, psychiatry, psychology, radiology, rheumatology and surgery. The domain currently generates around 25 thousand page views per day which is an 250% increase from 10 thousand page views per day during the first quarter of this year. For disseminating content through different channels, the site maintains new GeoScience.net RSS feeds and new accounts at Twitter and Facebook. GeoScience.net accepts advertisements either directly or through AdSense.